Three days ago, sunspot AR2736 did not exist but now stretches more than 100,000 km across the Sun and is growing rapidly. Despite the fact, our Sun is now into Solar Minimum, sunspot AR2736 has spat out 10 C-class solar flares in the last two days. According to Spacweather.com, sunspot AR2736 has a complicated magnetic field that is crackling with C-class solar flares. Sunspots are islands of magnetism floating on the surface of the sun. Most sunspots, like most magnets, have two poles + (N) and - (S). Sunspot ARorio2736, however, has multiple poles with areas of + and - jostling against one another. 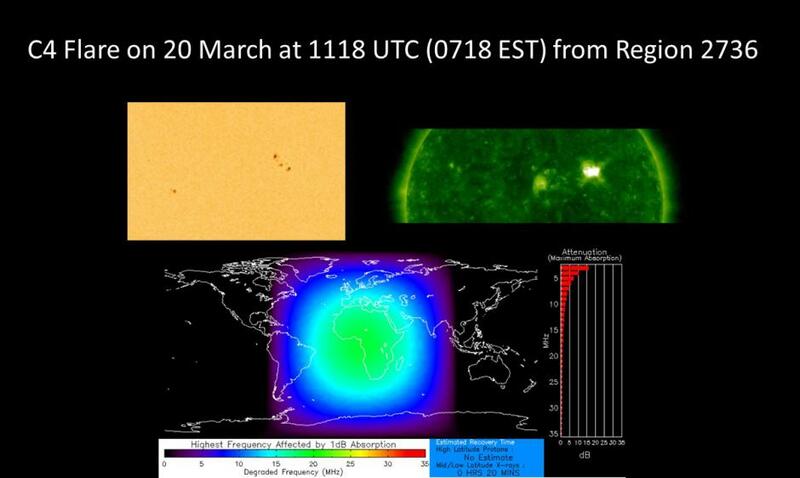 This is why the sunspot is crackling with flares. Magnetic field lines of opposing polarity criss-cross and explode--a process is known as magnetic reconnection. In the grand scheme of space weather, C-class solar flares are not considered to be major events. However, these explosions are noteworthy now because the sun has recently been so quiet. In context, C-flares represent a real uptick in solar activity. They can ionize the top of Earth's atmosphere, disturb shortwave radio communications, and even hurl CMEs toward Earth. Indeed, one is heading our way now. Ahhh,can't wait for solar max. See how far we rise in temps.